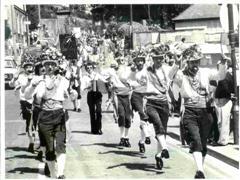 The Rumworth Morris was formed in 1976. Its founder members had experience of dancing with a variety of different North West Morris sides, particularly Manchester Morris Men. In choosing a base location, the founders were keen to find somewhere with a solid industrial history, as befits the North West style, and a lively modern community. They eventually settled on the Rumworth district of Bolton, Lancashire. For over 30 years the side was still based in that district, practising at Deane Memorial Hall on the third Thursday of each month, although building works forced us to move firstly to an alternative venue at a school in Walkden and more recently to a church hall in Patt Bridge, Wigan. Rumworth practised for eighteen months before performing in public for the first time. There was a commitment from the start that public performances would be to a high standard. The public debut took place at Rivington Lower Barn in 1978. Geoff Hughes has been the team’s official conductor throughout its life, though others have conducted proceedings on the rare occasions that he has been absent. Rumworth appeared at Chippenham and Lacock Folk Festival for the first time in 1978, and we have continued to perform there (the festival is now officially known simply as Chippenham Folk Festival) at regular intervals. Other festivals we have danced at include Sidmouth, Wareham, Wimborne, Bridgnorth, Warwick, Holmfirth, Cleckheaton, Shrewsbury, Ely and Beverley. We have made several forays into continental Europe. Notable trips include two visits to Antwerp as guests of the Lange Wapper sword dancers and a week-long trip to Lunen, near Dortmund in Germany, as representatives of the city of Salford. Whilst opportunities to dance in foreign parts such as Belgium, Germany, Oxfordshire and Devon are always welcome, our home has remained very much in Bolton and the industrial North West of England. Annual events that we have been proud to support include Whitworth Rushcart (until its sad demise some years ago) and Horwich Morris Dancers’ Day for Saint George. A less specialised part of the North West scene that we have appeared at regularly is the summer carnival. North West Morris is essentially a processional style of dance, and Rumworth has always welcomed any opportunity to perform in this manner. The longer the better! In September 2011 we celebrated our 35th Anniversary with a weekend of dance attended by a number of teams with whom we have danced over the years. in September 2016 we celebrated our 40th Anniversary with a Day of Dance in Bolton with guest teamsfollowed by a social evening where we were joined by some of our former members.